If you are planning a wedding locally, you have a lot of great Milwaukee wedding venues to choose from. In my experience, most area couples are still very traditional when it comes to where they get married and hold their receptions. Venue selection is usually dictated by family tradition, the number of invited guests, and most importantly, the budget. That’s why most wedding ceremonies are usually held at a house of worship, with the reception following at a banquet hall, country club, or hotel ballroom. Many couples however, are looking for non-traditional wedding venue alternatives. If you’re one of those couples, here are some of my favorite Milwaukee wedding venues where we have done weddings and events. Truly a beautiful spot for both a wedding and reception, especially May-August. In my opinion, the one of the best outdoor Milwaukee wedding venues. Having done flowers for several outdoor ceremonies here, I think it’s beautiful setting for a wedding ceremony. Can be a bit windy and chilly however, especially if the wind is coming in off the lake. Although there are several venues at the zoo available, my favorite is the Peck Welcome Center. Most recently, we did a jungle-themed event there. Having done wedding flowers in both the Charles Allis and Villa Terrace Museums, my favorite is Villa Terrace. If the weather cooperates, ceremonies can be held on the outdoor balcony, with it’s fantastic view of the lakefront and the gardens below. If you’re not familiar with Milwaukee’s east side, this is one of the historic Milwaukee wedding venues you might easily overlook. It’s a great place to combine both the ceremony and reception in a very beautiful and elegant setting. One of Milwaukee’s favorite year-round spots for wedding photos, it’s also a great venue for a seasonal wedding ceremony (in the show dome), as well as a reception. You won’t need much in the way of ceremony flowers here. The new lighting in the Domes is really amazing! In my opinion, definitely the crown jewel of Milwaukee wedding venues. Located on Milwaukee’s lakefront, it’s the city’s most visually-striking venue, both indoors and out. Beautiful views of the lakefront. An awe-inspiring place for a wedding or reception. 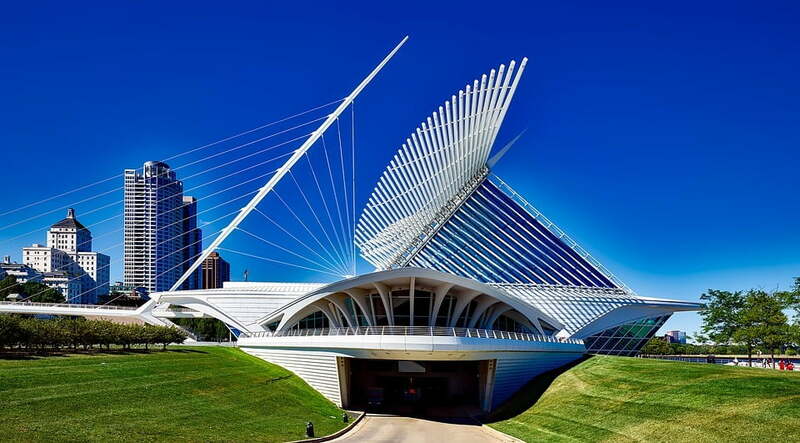 Located just across Lincoln Memorial Drive from the Milwaukee Art Museum and the War Memorial, the Miller Pavilion also offers a great view of the lakefront. At one recent wedding we did, the rehearsal dinner was held here on Friday night, while the wedding and reception was held across the street at the War Memorial on Saturday. One of my favorite spots for an outdoor wedding. If you’re looking for a naturally beautiful outdoor setting for your wedding, check out the pavilion here, which overlooks the lake. This is a venue that’s not on a lot of people’s radar. Since it’s restoration several years ago, the Conservatory has become one of my favorites for a small, intimate wedding or reception. One of newest Milwaukee wedding venues, Pier Wisconsin is another one of our lakefront gems. Having done events in both the Pilot House and Promenade, I can tell you that the views of downtown and the lake are both fantastic. Small, intimate weddings are something we have been doing more of lately. The couple we worked with on this wedding, held their ceremony at noon on the staircase, then walked up to an afternoon reception at Lake Park Bistro, located at the top of the staircase. Each of the Milwaukee wedding venues I’ve highlighted presents a unique and different wedding experience. But by no means is this a complete list. Milwaukee has a lot more great wedding venues. More of my favorites can be found here. And as always, I love reading your comments. If you would like to share your experience with any of the Milwaukee wedding venues I’ve mentioned, or any others, feel free to do so. Use the comments section below. When Buying Flowers, Moms Rule!